The kidnapped father of Chelsea and Nigeria footballer John Mikel Obi has been freed by police. Officers raided a neighbourhood in the Nigerian city Kano on Monday where they found Michael Obi and arrested five suspects. Obi was kidnapped on 12 August as he travelled home from work in the city of Jos, around 200 miles away from Kano. He told reporters: "I started begging them but they beat me mercilessly. They kept me in a terrible place." 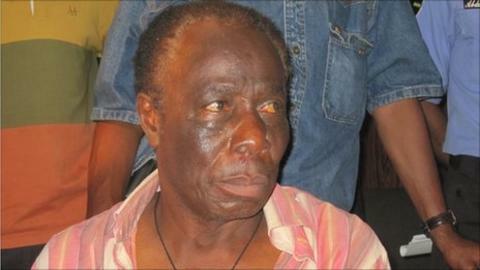 The BBC's Yusuf Ibrahim Yakasai said Obi's face showed signs of the beatings that he says he endured during his ordeal. "I was taken right deep into the bush, in an isolated area in Jos", Obi said. "There are five of them and they were dressed in military uniforms. They pushed me into a vehicle painted in military colours and began to drive very fast. I never knew a vehicle can fly like that." Mikel's management company Sport Entertainment & Media Group (SEM) said in a statement: "Earlier today Michael Obi called his family to advise them that he had been released by his abductors. "John Obi Mikel would like to thank everyone in Nigeria, his family and friends, Chelsea FC and their fans and his agents for their total support during this terrible time." During the time of his father's disappearance, Mikel continued playing for Chelsea - starting matches against both Stoke City and West Bromwich Albion. On Friday, Chelsea manager Andre Villas-Boas hailed the "amazing mental toughness" shown by the midfielder in the wake of his father's kidnapping. A Chelsea statement said: "Mikel has shown outstanding commitment and professionalism during this most difficult of times, and the club will continue to offer its full support to him and his family."